Everyone loves the flavours of the Southwest. 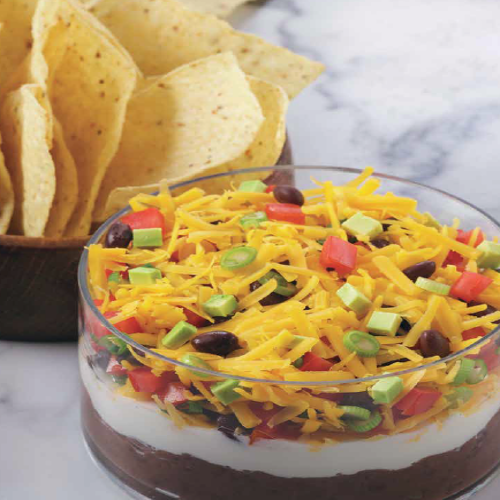 Make this healthy and filling Seven-Layer Southwest Dip as an appetizer for your next party. You can customize it by adding your favourite ingredients, such as diced pitted olives, tomato salsa and even sautéed ground beef or shredded chicken. Serve with baked tortilla chips or sliced fresh vegetables. 1. In a small saucepan over medium heat, heat the refried beans just until warmed through and spreadable, 1 to 2 minutes. (Alternatively, place in a microwave-safe bowl and heat on high for about 45 seconds.) Using a spatula, spread the beans evenly over the bottom of a shallow clear glass bowl. 2. In the following order, spread the remaining fillings over top of the beans in even layers: sour cream, avocado, 3/4 cup (185 mL) cheddar cheese, tomato, black beans, remaining 1/4 cup (60 mL) cheddar cheese and green onions. 3. If desired, chill dip before serving.